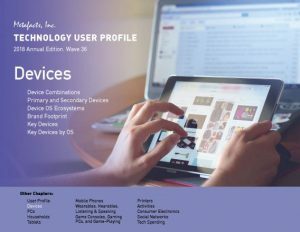 This chapter section provides a top-level overview of technology users based on the devices they use. More-detailed analysis is included in other chapters, referenced below. What is the age gap between the users of Smartphones and Basic cell phones? What is the mix of devices that people actively use? Do Smartphone users use more or fewer connected devices than average? Which segment has the highest usage of Laser Printers? Do Tablet PC users use more or fewer connected devices than other users? Do employees in larger or smaller employers use more printers? Are Smartphone users more or less likely to be using a Tablet PC? Do younger employeds spend more or less time with their PCs than other connected adults? Which lifestage group has the highest usage of Notebook PCs? Which age group has the highest usage of e-Book Readers? Which segments have the highest share of Windows, Apple, and Google OS devices? Which age group has the highest usage of Notebook PCs? Are older or younger adults more likely to use Desktop PCs? How does the mix of devices differ between employees of small, medium, and large employers? Are older or younger employees more likely to use Desktop PCs? Which lifestage segments have the highest share of Windows, Apple, and Google OS devices? Are younger or younger employeds more likely to use an All-in-One Desktop PC? Which segment has the highest share using Apple iTunes Store or Google Play Store? Are younger employeds more likely to use a Desktop or Notebook PC as their Primary PC? Which segment has the highest usage of e-Book Readers? Who use the most Tablets – Younger employed, Older employeds, Older not-employeds, or Younger not-employeds? Which segment has the highest usage of Notebook PCs? How do users of Notebook PCs compare to those who use them in one or many locations? Which other connected devices do users of actively mobile PCs use? Do the users of actively mobile PCs own more or fewer connected devices? Who are the users of actively mobile PCs? How are TV and movie devices different across Life Stage segments? Do people with newer PCs have a different mix of connected devices than others? Do newer PCs go to younger or older adults? Which segment has the highest buying plans for iPhones or Android Smartphones? Which Home PC segment has the biggest tech purchase plans? Do recent Home PC buyers have stronger or weaker tech buying plans than average? Which Life Stage segment use portable Hotspots the most? Which segment has the lowest usage of Multi-Function Printers? 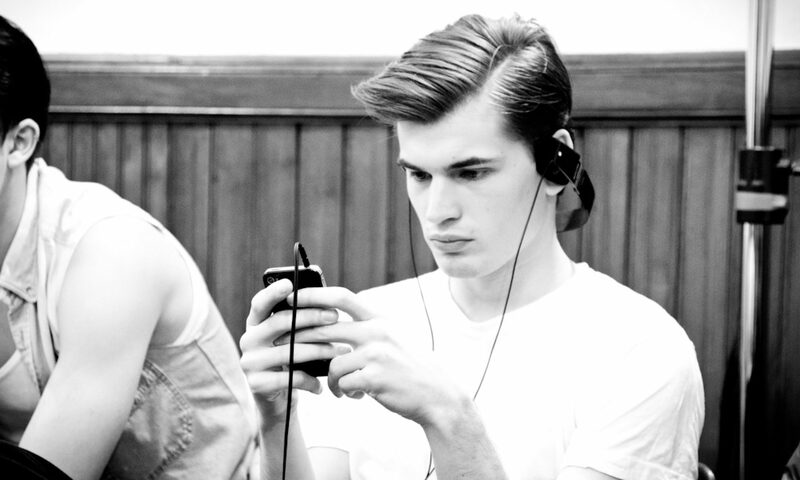 Are Smartphone users more or less likely to be using an iPod or MP3 player? Is there an age or gender skew to social networking, or certain networks? Are millennials more likely to be using a Home PC, Work PC, or some other PC? Are Tablet PCs an entry-level connected device for lower socioeconomic segments? Who’s more likely to be using Public/Shared (non-Home, non-Work) PCs – Millennials or Boomers? Are the college-educated focused on certain social networks? Do the self-employed frequent certain social networks? Where do today’s students socially network? How much is tablet adoption linked to children being in the household? Are Tablet PCs more for lower-socioeconomic groups, or one of many owned by higher-income adults? Which social networks have the highest-income households? Are employees in certain industries more likely to be tech laggards? Who wants to wear wearable technology? Who uses their Smartphone as their primary connected device? Are HP’s customers more demographically similar to Dell’s or Google’s? How demographically similar are Apple’s best customers to Google’s? Are the highest share of Millennials in Apple’s footprint, Google’s, or Dell’s? Which brand footprint has the highest share of full-time-employeds?